One of the best classes I have signed up for this semester is Wildlife Surveys. I entered the Nicholas School at Duke with little (okay, almost zero) field experience. Though I love the outdoors, I have never before studied it as systematically as I am now. Wildlife Surveys, in addition to my ecology courses, is giving me real skills that I can take out into the woods, but it is also expanding my comfort zone. I have now taken my first forays into bird and mammal surveys, and I am happy to say I am ready for more! My first official bird survey took place on a wintery morning on the last day of January. I had participated in one bird count before as part of the Nic Nats, but to be honest I had spent little of my time counting, letting our walk leader keep track of the species. 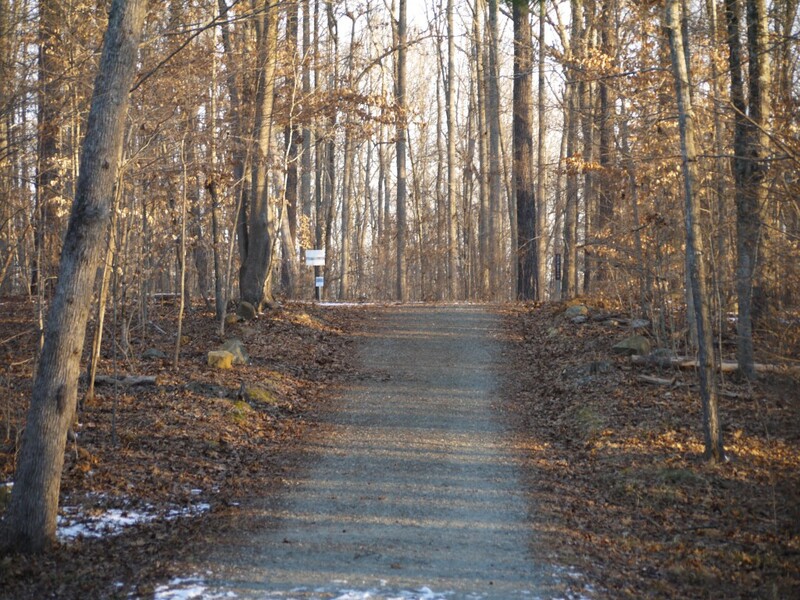 As we slammed the car doors and headed out into the chilly Duke Forest however, I knew it was my turn to pay attention. 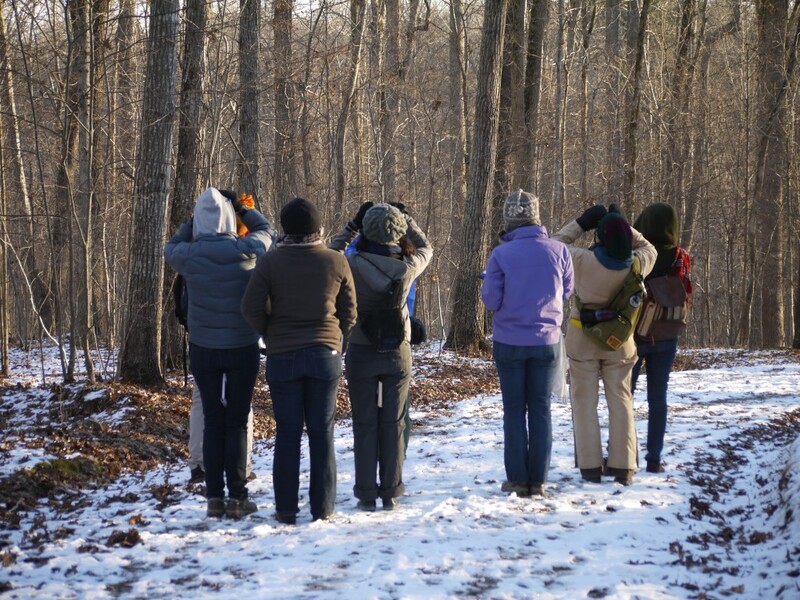 The nine of us, wrapped head to toe in scarves, coats, hats, and gloves to battle temperatures that hovered in the mid-thirties, followed dutifully behind our instructor as she described bird calls and gave us tips on what to look for. Our boots crunched the frozen snow and patches of dried leaves – an important auditory inhibitor that we noted on our official record of the morning’s walk. Winter is a wonderful time to bird, as the bare branches make any moving critter easy to spot. 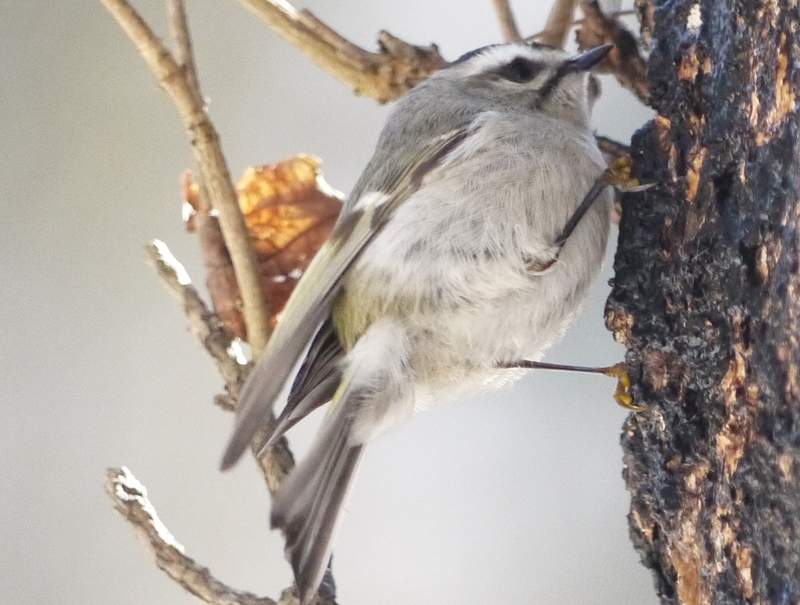 We saw Tufted Titmice, Blue Jays, Carolina Chickadees, Downy Woodpeckers, Golden-crowned Kinglets, even a Red-shouldered Hawk as we carefully made our way along the loop. 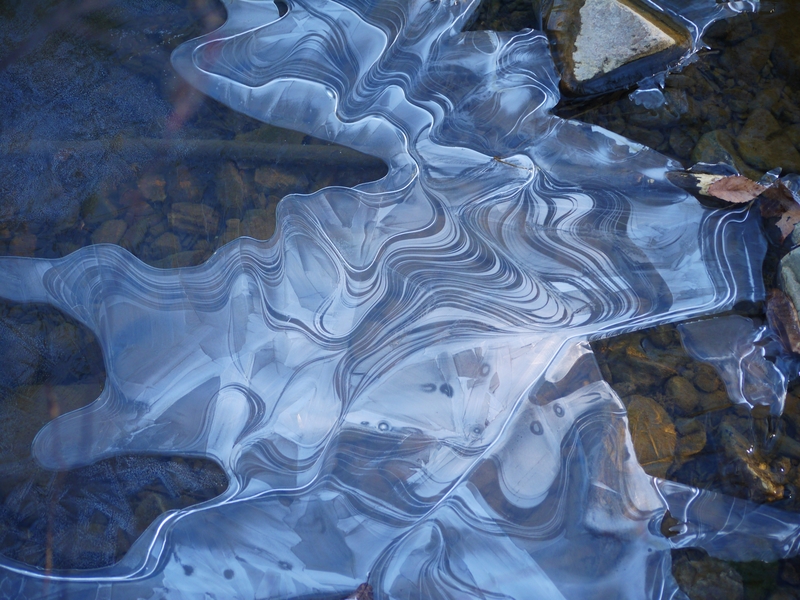 We turned a corner and found ourselves facing the creek, and for a moment took our minds off birding to appreciate the waves and swirls the ice had created along the water’s surface. The only sounds we could hear were the rushing of the current, the tittering of kinglets dancing in the canopy overhead, and our own breathing. We saw thirteen species that day, a number that can be compared with the many records previous birders have kept as they walked along this special loop. Still, I’ve been birding for over a year now, and felt myself at least an intermediate avian surveyor, if not an expert. That all changed the moment I pulled up to the Duke Forest maintenance house to report for my first deer survey last night. I have never done a mammal survey, let alone one for such large creatures. Ten of us in all gathered in front of five Duke Forest trucks, pairing off so that each truck would have one (certified) driver and one passenger. 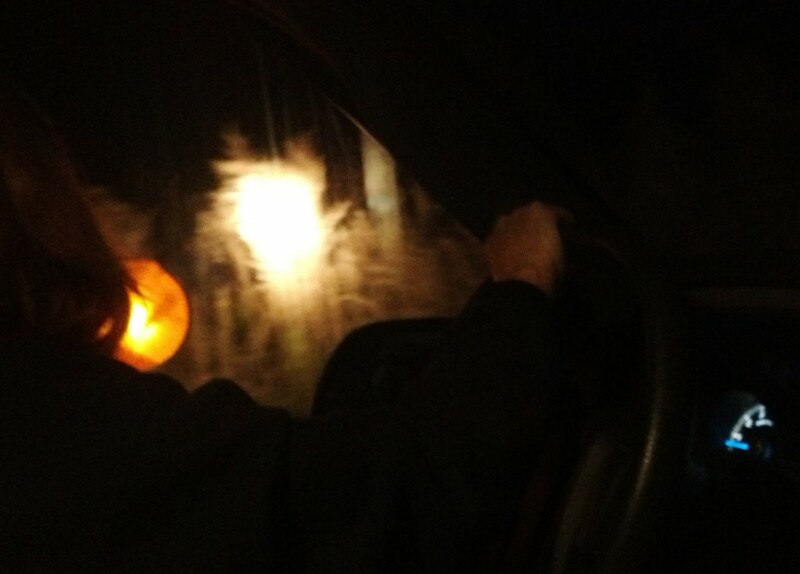 We were each given a bright yellow spotlight and a set of directions: drive less than five miles per hour on pre-specified routes, shine the light into the forest in the hopes of catching its reflection in the eyes of a deer, and record each observation and time of observation. I was paired with a wonderful woman named Beverly, who never laughed at me when I had trouble opening the gates or when I accidentally wrote on my face in an effort to quickly record an observation (don’t ask me how, it just happened). 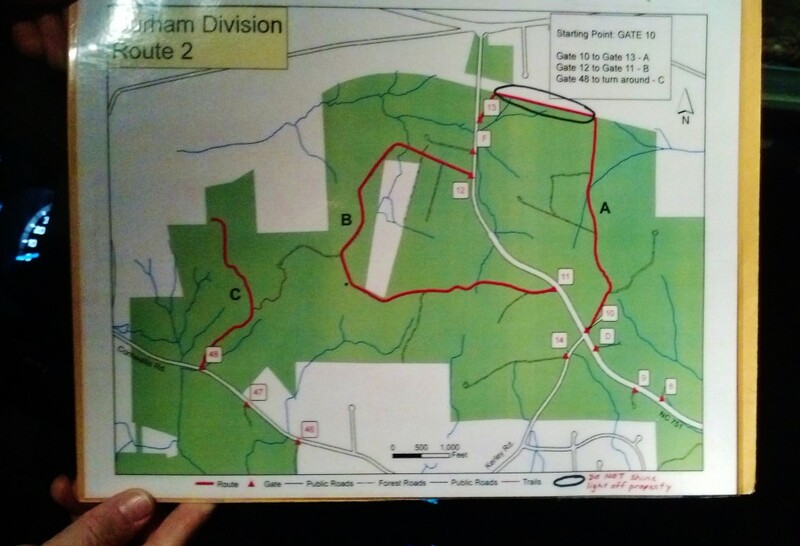 Though I was a little nervous when we set out, the deer survey was an amazing experience. The forest at night has a completely different feel compared to the forest during the day, and it was excitingly eery as we drove slowly down the dirt road, pivoting our spotlights back and forth looking for any sort of reflection. We hadn’t gotten far before I saw my first glow. At first I thought I was imagining things, but figuring I didn’t want to blow what could be my first stop, asked Beverly to reverse the truck so I could get a better look. Sure enough, my spotlight revealed not one reflection but two – the eyes of a deer! I practically squealed with the delight of discovery that only grew when our lights revealed two more pairs of eyes. Three deer already and we had only just begun! Farther down the road we heard a familiar yet foreign “hoo hoo, hoo hoo,” and when we slanted our lights up into the boughs of a tree we saw the bright silhouette of what was probably a large Barred Owl. He peered down at us for a moment, then spread his wings and took off into the night. These are things you just don’t see during the daylight hours, even if you spent all day looking. Three road segments had been assigned to us, and we found a herd of eight deer on our second transect, though were skunked on the third. We had been out two hours. Though it had been a warm day, the temperature was quickly dropping, and while I could have looked for deer half the night part of me (the cold part) was glad to roll up the windows and head for home. To anyone out there contemplating participating in a wildlife survey, whether it be for a research institution or a citizen-science project, I highly recommend you break out of your comfort zone and try it – you will see wildlife in a new way, and you will be contributing valuable scientific information that can be used later in strategic planning and in setting conservation priorities. It’s a Wildlife Surveys win-win! I remember my first bird count, Erika. I was in high school and it was a very organized Audubon Christmas Bird Count. What a thrill to see my name in print as a bird counter with many others, mostly who were older and more experienced. As I advanced in my career as a natural resource professional, I learned how to suvey a diversity of species – just as I learned of various ways to identify trees (leaves, bark, crown shape, buds, flowers, seeds). Mariposa lily surveys in California, salamander traps in Pennsylvania, and tree densities in North Carolina. Even estimating deer population can be done as you do with night time (or day time) visual road surveys, night time infrared camera, aerial infrared surveys, and deer droppings. Have you tried aging a deer from jaw and teeth samples? And then, all that data can be analyzed to reveal the relationships between species and their habitats. May you discover many fascinating and wonderful finds in the natural world! Hi, Erika! I saw your post on Duke web front page when I was looking for some info about grad school enrollment (hopefully I can apply to Duke this year!). You’re not alone. I consider myself lack of experience in wildlife survey too, though I have to admit being in the wild is addictive. Funny thing is that I learned a lot about marine mammals survey (e.g. whale monitoring) from being a birder/involved in bird survey. Birders have sharp eyes and sensitive hearing, so doing surveys with them is like exercising to be more aware of our surroundings.